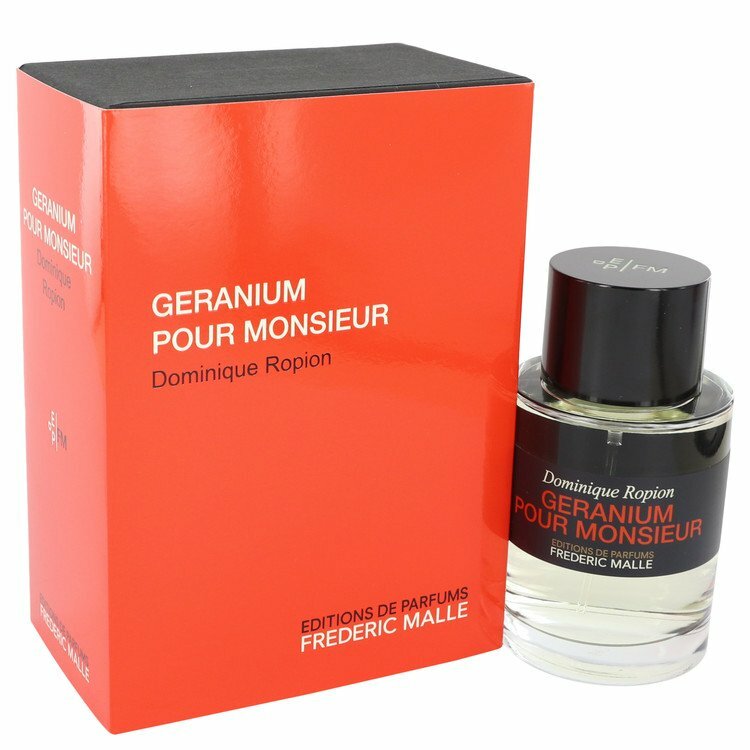 There are 56 reviews of Géranium pour Monsieur. Géranium pour Monsieur is an aromatic woody composition, first launched in 2000, and surely reformulated or retouched over the next seventeen years. I've been familiar with it since 2014, and wearing it has been an experience of joy and frustration. The first phase of Géranium pour Monsieur is herbal, dominated by an intense note of mint; heaven for mint lovers, hell for those who don't like it. This is my favourite part, and it works like a charm - especially after a shave. The mint is paired together with a geranium, which slowly blooms before maturing at about one to two hours. I discern a mild spice aspect, involving eugenol and traces of cinnamon. It is from this stage onwards that Géranium pour Monsieur quickly dies down on my skin to a base of nondescript white musks (but not strong, unlike the laundry musk of Cologne Indelebile) and woods, that one can barely register. A very promising aromatic disintegrating into a limp fresh-woody fragrance. While Géranium pour Monsieur is one of the few mint compositions that avoid the olfactory cliché of toothpaste, it is eventually insubstantial and underwhelming. I feel that this is one of the Malle compositions (together with Vetiver Extraordinaire) that is in serious need of a renovation. In my experience (based on bottles I owned), it lasts longer in slightly cool and dry weather, rather than summers; in fact, this was once featured as a fall pick by Katie Puckrik. Given its current incarnation, I find Mugler's Fougere Furieuse to be a far more compelling alternative when looking for a modern fresh-aromatic with a prominent geranium. Another possibility is Equipage Geranium; while there's a plethora of mint fragrances on the market to choose from starting with Lush's Dirty, toothpaste or otherwise. I'm torn between neutral and thumbs up on this one. I smell mint, and sometimes a spicy cinnamon, especially early on. The initial opening is exciting; some of the early transitions are challenging; and the base is a nice minty floral with good longevity and some rewarding moments that win me over. From a 5ml sample over 3 days. For over a year I've been searching for a mint-based fragrance, because I don't identify with citrus, and I've sampled many. How ironic, that I finally happen upon this, the one that I like best of all, that certainly has mint, but only in a minor role. Geranium: alien to my northern nose, yet feels like it should have been a scent I've always known. Not too much mint at the start, a cool, fresh, lemony-rosey floral that makes me think of Turkish Delight confectionery. And a second later is an authentic herbaceous smell. Like pressing your face into a green bouquet covered with cold raindrops. Or a garden, covered in dew, in the morning before everything starts again. Like someone else said here, it's uplifting, it is really uplifting. Then it's soapy, like really old fashioned soap. What an enigma: times an intensely real unmistakable mint and floral, times an absolutely synthetic, soapy rose. For something that is, at face value, simple and linear, it isn't, it plays with you, like a cool breeze blowing in suggestions of the garden flowers outside in through a bathroom window. I thought this would be so so easy to explain, but in reality I can't find the right language to describe this lovely scent. It's sillage is soft, it won't turn heads, but that's not important to me as this is an intensely personal experience which isn't about other people. There are other scents, other times, for that. Longevity is several hours, although all but the first of those hours are a faint, cool, fleeting floral breath, that briefly blows in the window, or the faintest reminder of the soap you washed with (take your choice) just when you think it was gone forever, never to return. It opens minty, but not herbaceous mint leaves; it has the geranium leaves smell, which can be minty and rough, raw. The opening is accentuated by anise and the scent feels soapy and dusty, clean and dirty at the same time, like I imagine an old bar of soap would smell. One hour in, the mint calms and a light sweetness reveals itself. To me, it smells like a freshly washed up skin at first which then goes into the fresh laundry territory. The fragrance doesn't have much volume or weight after the first hour, it is light with minimal projection. The scent shifts from a masculine, cold and serious beginning to a unisex, clean and warm dry down. This is the best part but unfortunately I can barely smell it. Instead of plunging deeply into a monofloral intensive opening blast à la Mona di Orio's Carnation, Géranium pour Monsieur pairs the note hat gives it its name - geranium - with a gorgeously refreshing mint note. This is not cheap chewing-gun mint but a natural high quality version, and it blends in perfectly with the lovely geranium impression. The drydown starts with a rather synthetic sweetish note, but soon a reasonable cinnamon emerges that is quite convincing and not too sweet, and in the base I also get an ambroxan with some styrax. The performance is very good with moderate sillage, good projection and a longevity of eight hours on my skin. There are no member images of Géranium pour Monsieur yet. Why not be the first?